Citation Information: J Clin Invest. 2019. https://doi.org/10.1172/JCI98785. Constitutive JAK2 signaling is central to myeloproliferative neoplasm (MPN) pathogenesis and results in activation of STAT, PI3K/AKT and MEK/ERK signaling. However, the therapeutic efficacy of current JAK2 inhibitors is limited. We investigated the role of MEK/ERK signaling in MPN cell survival in the setting of JAK kinase inhibition. Type I and II JAK2 inhibition suppressed MEK/ERK activation in MPN cell lines in vitro, but not in Jak2V617F and MPLW515L mouse models in vivo. JAK2 inhibition ex vivo inhibited MEK/ERK signaling suggesting cell extrinsic factors maintain ERK activation in vivo. We identified PDGFRα as an activated kinase that remains activated upon JAK2 inhibition in vivo, and PDGF-AA/PDGF-BB production persisted in the setting of JAK kinase inhibition. PDGF-BB maintained ERK activation in presence of ruxolitinib consistent with its function as a ligand-induced bypass for ERK activation. Combined JAK/MEK inhibition suppressed MEK/ERK activation in Jak2V617F and MPLW515L mice with increased efficacy and reversal of fibrosis to an extent not seen with JAK inhibitors. This demonstrates that compensatory ERK activation limits the efficacy of JAK2 inhibition and dual JAK/MEK inhibition provides an opportunity for improved therapeutic efficacy in MPNs and in other malignancies driven by aberrant JAK-STAT signaling. Citation Information: J Clin Invest. 2019. https://doi.org/10.1172/JCI97482. 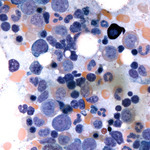 The most frequent subtype of acute myeloid leukemia (AML) is defined by mutations in the nucleophosmin 1 (NPM1) gene. Mutated NPM1 (ΔNPM1) is an attractive target for immunotherapy, since it is an essential driver gene and 4 bp frameshift insertions occur in the same hotspot in 30%–35% of AMLs, resulting in a C-terminal alternative reading frame of 11 aa. By searching the HLA class I ligandome of primary AMLs, we identified multiple ΔNPM1-derived peptides. For one of these peptides, HLA-A*02:01–binding CLAVEEVSL, we searched for specific T cells in healthy individuals using peptide-HLA tetramers. Tetramer-positive CD8+ T cells were isolated and analyzed for reactivity against primary AMLs. From one clone with superior antitumor reactivity, we isolated the T cell receptor (TCR) and demonstrated specific recognition and lysis of HLA-A*02:01–positive ΔNPM1 AML after retroviral transfer to CD8+ and CD4+ T cells. Antitumor efficacy of TCR-transduced T cells was confirmed in immunodeficient mice engrafted with a human AML cell line expressing ΔNPM1. In conclusion, the data show that ΔNPM1-derived peptides are presented on AML and that CLAVEEVSL is a neoantigen that can be efficiently targeted on AML by ΔNPM1 TCR gene transfer. Immunotherapy targeting ΔNPM1 may therefore contribute to treatment of AML. Citation Information: J Clin Invest. 2019. https://doi.org/10.1172/JCI122694. The development and function of stem and progenitor cells that produce blood cells are vital in physiology. GATA2 mutations cause GATA-2-deficiency syndrome involving immunodeficiency, myelodysplastic syndrome (MDS) and acute myeloid leukemia (AML). GATA-2 physiological activities necessitate that it be strictly regulated, and cell type-specific enhancers fulfill this role. The +9.5 intronic enhancer harbors multiple conserved cis-elements, and germline mutations of these cis-elements are pathogenic in humans. Since mechanisms underlying how GATA2 enhancer disease mutations impact hematopoiesis and pathology are unclear, we generated mouse models of the enhancer mutations. While a multi-motif mutant was embryonic lethal, a single-nucleotide Ets motif mutant was viable, and steady-state hematopoiesis was normal. However, the Ets motif mutation abrogated stem/progenitor cell regeneration following stress. These results reveal a new mechanism in human genetics in which a disease predisposition mutation inactivates enhancer regenerative activity, while sparing developmental activity. Mutational sensitization to stress that instigates hematopoietic failure constitutes a paradigm for GATA-2-deficiency syndrome and other contexts of GATA-2-dependent pathogenesis. Citation Information: J Clin Invest. 2018. https://doi.org/10.1172/JCI99386. Targeted therapy with small molecules directed at essential survival pathways in leukemia represents a major advance, including the phosphatidylinositol-3′-kinase (PI3K) p110δ inhibitor idelalisib. Here, we found that genetic inactivation of p110δ (p110δD910A/D910A) in the Eμ-TCL1 murine chronic lymphocytic leukemia (CLL) model impaired B cell receptor signaling and B cell migration, and significantly delayed leukemia pathogenesis. Regardless of TCL1 expression, p110δ inactivation led to rectal prolapse in mice resembling autoimmune colitis in patients receiving idelalisib. Moreover, we showed that p110δ inactivation in the microenvironment protected against CLL and acute myeloid leukemia. After receiving higher numbers of TCL1 leukemia cells, half of p110δD910A/D910A mice spontaneously recovered from high disease burden and resisted leukemia rechallenge. Despite disease resistance, p110δD910A/D910A mice exhibited compromised CD4+ and CD8+ T cell response, and depletion of CD4+ or CD8+ T cells restored leukemia. Interestingly, p110δD910A/D910A mice showed significantly impaired Treg expansion that associated with disease clearance. Reconstitution of p110δD910A/D910A mice with p110δWT/WT Tregs reversed leukemia resistance. Our findings suggest that p110δ inhibitors may have direct antileukemic and indirect immune-activating effects, further supporting that p110δ blockade may have a broader immune-modulatory role in types of leukemia that are not sensitive to p110δ inhibition. Citation Information: J Clin Invest. 2018. https://doi.org/10.1172/JCI99933. Citation Information: J Clin Invest. 2018. https://doi.org/10.1172/JCI122533. Concordant activation of MYC and BCL-2 oncoproteins in double-hit lymphoma (DHL) results in aggressive disease that is refractory to treatment. By integrating activity-based proteomic profiling and drug screens, polo-like kinase-1 (PLK1) was identified as an essential regulator of the MYC-dependent kinome in DHL. Notably, PLK1 was expressed at high levels in DHL, correlated with MYC expression and connoted poor outcome. Further, PLK1 signaling augmented MYC protein stability and, in turn, MYC directly induced PLK1 transcription, establishing a feed-forward MYC-PLK1 circuit in DHL. Finally, inhibition of PLK1 triggered degradation of MYC and of the anti-apoptotic protein MCL1, and PLK1 inhibitors showed synergy with BCL-2 antagonists in blocking DHL cell growth, survival and tumorigenicity, supporting clinical targeting of PLK1 in DHL. Citation Information: J Clin Invest. 2018. https://doi.org/10.1172/JCI121876. MASTL, a Ser/Thr kinase that inhibits PP2A-B55 complexes during mitosis, is mutated in autosomal dominant thrombocytopenia. However, the connections between the cell cycle machinery and this human disease remain unexplored. We report here that, whereas Mastl ablation in megakaryocytes prevented proper maturation of these cells, mice carrying the thrombocytopenia-associated mutation developed thrombocytopenia as a consequence of aberrant activation and survival of platelets. Activation of mutant platelets was characterized by hyper-stabilized pseudopods mimicking the effect of PP2A inhibition and actin polymerization defects. These aberrations were accompanied by abnormal hyper-phosphorylation of multiple components of the actin cytoskeleton and were rescued both in vitro and in vivo by inhibiting upstream kinases such as PKA, PKC, or AMPK. These data reveal an unexpected role of Mastl in actin cytoskeleton dynamics in postmitotic cells, and suggest that the thrombocytopenia-associated mutation in MASTL is a pathogenic dominant mutation that mimics decreased PP2A activity resulting in altered phosphorylation of cytoskeletal regulatory pathways.